We had the pleasure to Interview the hottest metal band of the planet with our one and only Carla Harvey. Let’s hear from this beautiful lady. Greetings from MHF Mag, how are you today? Hey Keith, doing well, was tired from the show this evening, It’s almost 10 here, how are you? Carla I’m doing well, Thanks. “Lilith” was released on October 27, 2017, how do you feel about the outcome? It was fantastic, and we loved the entirety of this one, the fans loved it too, and been on tour in support of this one, We are really happy about the album. Lilith happened after the departure of Chris Warner, did his departure from the band affected the band and what was your thoughts when he left the band? We all are like friends and he got engaged and he couldn’t spend much time with the band, and we thought it’s best for him to leave the band as family and commitments comes first and we didn’t stop him from what he wanted. Last year you toured with Megadeth, Can you tell us about your experience? It was amazing and we were so happy and proud to be part of that tour, we all love Dave Mustaine and Megadeth, we had a fantastic time, the crow supported us, It was a great tour. Butcher Babies is not a genre, it’s from Thrash to heavy to punk and groove, why you thought of mixing everything into the band? We didn’t wanted to be genre specific and we don’t want to be sub-genred, for us its all bout metal, this is what we love and we wanted to do. So Carla can you tell me how Butcher Babies evolved? I went from Detroit to L.A. to make my dreams come true, there met the like musicians who have the same kind of passion and Butcher Babies was born. Any Plans on an International tour in Support of Lilith? Right now we are touring in USA, In early 2018 we are performing along with Hollywood Undead, although they are not a metal band, still we are touring and we will be performing in a couple of festivals in Europe and South America. 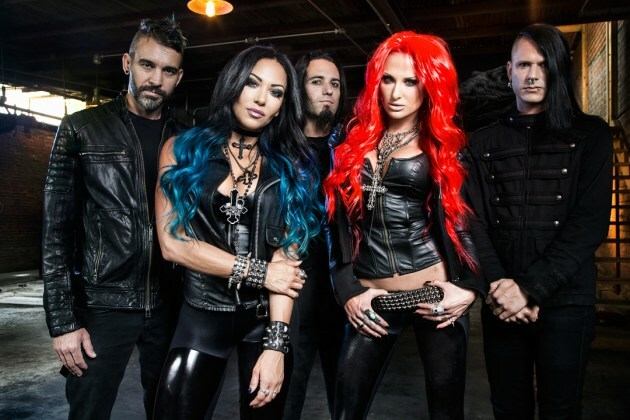 The whole world knows about Butcher Babies, How do you feel about your success? We are happy that there are a lot of fans around the world, who love and support us, But we often been called not metal enough and we are just posers. But thanks to the fans who always stood by us. So all these negativity has brought you down and how do you overcome it? We never took the negative energy into us, We love music and metal is what we live for and we will not stop following our dreams. What is the best memory from Butcher Babies So far? There are a lot and this one will always stay in our hearts, We had a tour in Tennessee and on the way our tour van broke down, and we had to rent a Pensky Truck and hit the road toward Tennessee, we missed the show but set up in the parking lot to sell merchandise and meet the fans after we headed back with the same Truck and while we pulled over in Interstate in Alabama for bathroom break and came out we were surrounded by Cops thinking we Kidnapped two girls in the truck, then we explained them our story, it was horrifying and a memory that will always stay. Thanks so much for supporting us over the years, we are here because of you and we will soon meet in the venue. Carla Thanks so much for the Interview, you have a Good Night? Thanks Keith for this Interview, was really happy to talk to you. You have a Good night.